Lindo Bem Equipado BHI Villa - 2 Carrinhos - Cozinha Lindo! Villa Popular 20 frostvilla Aluguer - Confira nossos comentários! 2019 As reservas estão agora abertas para novos hóspedes (a partir de 1 de janeiro de 2019). Se você enviou solicitações diretamente através do site do frostvilla, elas estão sendo processadas na ordem recebida na noite passada. Por favor, não se esqueça de incluir seu nome, endereço, telefone e endereço de e-mail com as datas solicitadas para o contrato de locação. Villa 20 recebeu uma cozinha completa e renovação de pisos em 2018. Os hóspedes desfrutam de aparelhos de ponta, juntamente com novos recursos de design. Realmente bom antes, com banhos atualizados, deck de sombra nível do solo opcional, carrinhos mais novos, etc. - os hóspedes vão encontrá-lo para ser excepcional agora. A resposta anterior dos convidados foi extremamente positiva. Excelente localização de lua de mel - isolamento de uma ilha tropical, mas fácil acesso à balsa para levá-lo longe da agitação do continente. Caminhada rápida para a praia ou piscina do clube.
. a casa é bem cuidada. Perfeito para férias em família ou casais em retiro. Aluguer inclui dois carrinhos de golfe - um de 6 passageiros e um de 4 passageiros - ambos com tampas de condução para protegê-lo se molhado ou frio. A meta do proprietário para todos os hóspedes é proporcionar uma experiência de locação excepcional. Temos prestado um serviço excepcional aos hóspedes que voltaram 7, 8 e 9 vezes. Entre a casa, o conteúdo, a localização e o serviço, geramos muitos comentários de 5 estrelas e os hóspedes que voltam de novo e de novo. A pé da praia, a pé da piscina Club, fitness center, restaurantes. Você não pode aliviar a localização. Associação temporária BHI Club INCLUÍDO em nossas tarifas de aluguel. Bela cozinha nova inclui café bar e estação de carregamento! Azulejo, pedra e vidro renovado Banhos! Melhorias anuais - mesma localização perfeita, por que procurar mais? Bald Head Island é um lugar como nenhum outro. É um lugar para relaxar e renovar com a família e seu outro significativo. A reclusão e beleza força você a abrandar e desfrutar da sensação de vida em 'tempo de tartaruga. " As crianças se divertem como as crianças se divertiram 100 anos atrás - construindo castelos de areia, andando de bicicleta, montando ondas e empinando pipas. BHI, acessível apenas por balsa de passageiros, viajar na ilha é de carrinho de golfe, andar ou patins. Nossa Villa está idealmente localizado a uma curta distância a pé da praia, piscina ou clube. As instalações do clube incluem refeições à beira da piscina casual ou elegante jantar club, campo de golfe George Cobb, campos de ténis, parque infantil, respingo almofada, sala de fitness e cadeiras de balanço na varanda clubhouse. Depois de desembarcar do passeio de balsa de 20 minutos do continente, um bonde levará você e sua bagagem até o Villa, onde seu carrinho de golfe para seis pessoas estará esperando na garagem, pronto para explorar a ilha. E para um lugar tão pequeno, há muito para ver. Opções incluem cozinhar em casa para fora na grade do gás ou em uma cozinha totalmente equipada depois de fazer compras em um mercado marítimo muito bem equipado, ou elegância casual nas salas de jantar no Bald Head Island Club ou com vista para o mar no The Shoals Club. No porto você pode arregaçar as mangas e começar uma panela de vapor preenchida com patas de caranguejo, mariscos, musels, camarão, batata e milho na espiga ao sentar-se ao ar livre e zona portuária em Mojo na Harbour. A parte mais difícil de ir para Bald Head está saindo! Master Bath and Guest Bath totalmente renovado para azulejo, vidro, granito e banheira. Chuveiro Mestre levantada. Chuveiro ao ar livre inclui vestiário adicional. Great Property in a Fantastic Location! This was the first visit to Bald Head Island for my wife, our 14-year-old son, and me. We could not have had a better time. 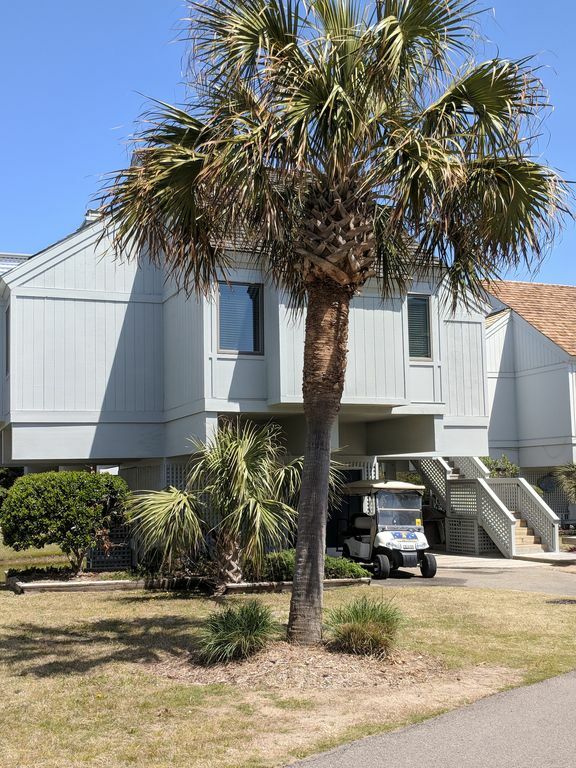 Villa 20 is well-appointed, and is in a great location just steps from BHI's South Beach and from the golf club (a priority for us). Despite Hurricane Florence having hit just a couple of months ago, everything about the property was in great condition and all in working order. Jack was very responsive, and attentive to every detail of the things we needed. We enjoyed ourselves so much, we did not want to leave and we are already looking forward to a return visit. We highly recommend this property for those interested in the BHI experience (which we rate at the top of North Carolina beach locations). Wonderfully villa and stay! Highly recommend! The villa was beautiful, super, super clean and very comfortable. From before we arrived until we left Jack checked on us and made sure everything was perfect. We loved riding in the golf cart and exploring the island. Walk across the street to the beach. What more do you need? We have rented a few other properties thru VRBO but this has been the best. Highly recommend this gem. Wow! What a kind review! You guys are awesome and welcome back anytime. Thanks for taking the time to appreciate our customer care. We try really hard to provide a great clean place to make island memories in. We are always open to guest's ideas, many of which have been incorporated to make it even better. Our goal is to be better than all the rest. Glad it worked for you guys. This was our first trip to BHI and we could not have had a better time! All communication before, during, and after was full of great information and responses were almost always immediate. Wonderful location, clean villa perfect for our family of 5. Our kids loved it as much as we did and it will definitely be the first of MANY trips to Bald Head. Thank you Jack Frost for the memories you have enabled us to make and have! This villa is a treasure...not only is it comfortable, immaculate, and beautifully renovated, it is also quite reasonably priced, and proved to be the perfect setting for our family vacation. The views from the uppermost deck are lovely, overlooking the ocean, perfect for early morning coffee or evening conversations. The villa was equipped with everything we needed, and the owner was incredibly helpful, kind, and quick to respond to any questions we had. We would completely recommend Frost Villa, without hesitation. Fabulous stay at villa 20! We had a fabulous stay at villa 20! The home had everything and more than expected! The views and proximity to everything can't be beat. Incredibly clean and recently updated. The kitchen was beautiful. And great golf carts which is very important to your stay on BHI! Trust me, not all homes have this. Best of all Jack is very easy to work with and very responsive to any questions. Can't wait to visit again! Amazing place!!! The house is beautiful, clean, well decorated especially the new kitchen. We just stayed here for a few days for our family vacation. This was the 1st time we visited Bald Head Island. We had never rented this way before and wasn't sure what to expect. It was an amazing place and the weather was perfect. The house is cozy, well decorated, clean, and had an amazing view. The kitchen is beautiful!!! We were lucky to use the kitchen right after the renovations. The house had everything we could possibly need! It comes with 2 golf carts, perfect for my husband, I and our children. The beach was steps away. The owner was very responsive, we had all the info we needed before we left, checked in on us via email and communicated when the damage deposit would be refunded. We love BHI and this was the best way to experience it. Thanks for sharing your beautiful beach home. We couldn't have asked for a better time on BHI! We will be back. Thanks so much for such a positive review. Guests like you are the ones we love to see come back year after year. Now that you found the island I hope you will come back and create more family memories. It really is a place like no other. Have a wonderful summer! associação temporária opcional ao Shoals Beach Club disponível. Daily rate beyond minimum stay decreases each subsequent day – request a quote or see rates in website frostvilla.com. Rentals of less than the minimum stay may be available for daily rate plus $150 cleaning. During the summer we rent Sunday to Sunday. Rentals of Saturday to Saturday will be considered for Spring Break and non prime summer weeks. Rates include cleaning fee, BHI Club fee, bed linens, bath and kitchen towels, dish and laundry soap, dish washing soap, dishwasher soap, bath and shower starter kit. Roundtrip ferry tickets are purchased at ferry landing, parking is paid upon departure like at airport. We only deal in checks and have done so since 2007. If you found us for the first time, Congratulations! We have nothing but 30-some 5 star reviews so you will have to trust that we will not double book our home and it will be as listed. Please phone me if you have any concerns or questions. We have a ton of folks who come back year after year who will be pleased to tell you what they like about us and our home.